I’m excited to be part of a new feature this year at the ninth annual Lewiston GardenFest: Garden Talk demonstrations. The Lewiston GardenFest is held by the Lewiston Garden Club and kicks off the garden walks of the National Garden Festival. I’ll be giving a new presentation, “Get Crafty in Your Garden,” at 2 p.m. Saturday, June 21 in the Community Tent located in the center of the festival on Center Street in Lewiston. (Part of Center Street is blocked off– You’ll find it.) 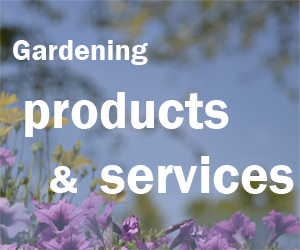 In my presentation, I’ll show you ideas for items you can make for your garden as well as from your garden. 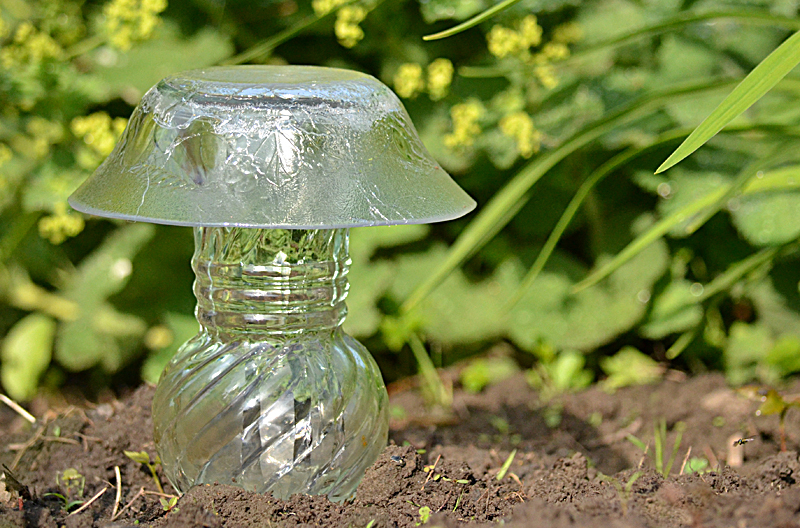 In this article I’ll share just one of those ideas: a mushroom decoration for your garden. You can make one to fill in a bare spot or create a whole grouping to add interest to a shady area. Mark Yadon, vice president of Mischlers Florist and Greenhouses, will demonstrate techniques for perennials in containers, including plant selection, care, maintenance and watering at 11 a.m.
Bob Bracikowski of Opportunities Unlimited will present “Herbs from Garden to Kitchen, Gifts to use in Cooking” at 11 a.m.
Colleen Gaskill, New York State Certified Nursery & Landscape Professional, will show how different color tones and textures of plants can complement each other in her demonstration titled “The Married Couple” at 2 p.m.
There’s lots more to do at the Lewiston GardenFest. Visit gardens. Several Lewiston and Youngstown residents will be showcasing their private gardens and opening them up to the general public. Join the free garden walk and view approximately eight public and private gardens on Saturday and Sunday, varying in size and style, located both within walking distance and also a short drive from Center Street. Maps highlighting the featured gardens will be available during the event at one of the hospitality booths. Get answers. Representatives from Cornell Cooperative Extension, the Hosta & Daylily Society, and the Iris Society will be available to answer your gardening questions throughout the weekend. Cornell Cooperative Extension will also be providing soil sample analysis. Participate in the Container Garden Contest. For those who may be hesitant to create a large garden or just don’t have the space, put your green thumb to the test and participate in the Container Garden Contest. Bring your special garden in a planter or any type of container, along with a stand for display, to the hospitality booth at 4th and Center Streets by 9 a.m. Saturday, June 21. Be creative and incorporate unusual accessories. Festivalgoers will be able to vote for their favorites throughout the weekend and prizes will be awarded to the top vote-getters. Visit vendors. More than 50 vendors will be selling flowers, plants, garden art and more. My niece, Carrie Hoffman of Cheektowaga, saw the idea for these mushroom decorations and sent it along to me. Thanks, Carrie! 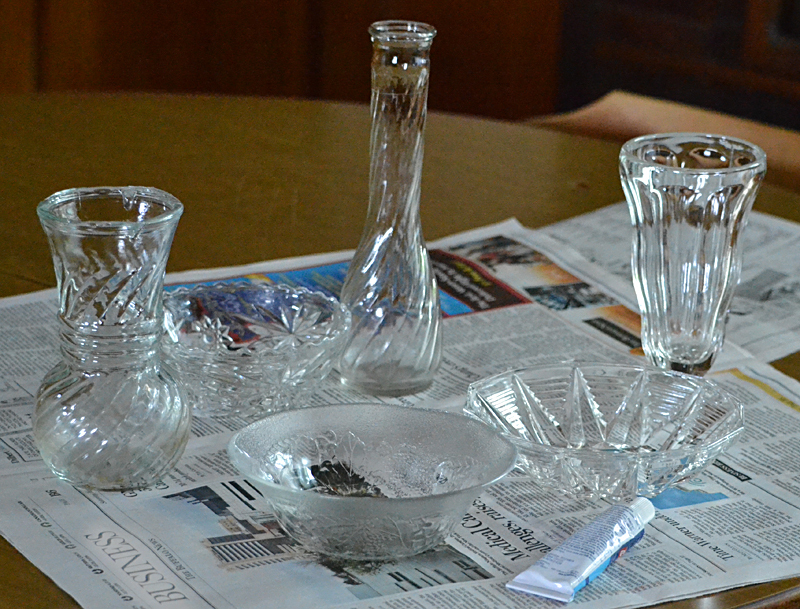 Find some clear glassware at a thrift store or garage sale. Vases and tall glasses make good stems and bowls make good mushroom caps. Clear glass works better than ceramic because glazed ceramic bowls usually have an unglazed ring on the bottom. When you flip the bowl over, it won’t look attractive as your mushroom cap. Go to the hardware store and buy some glue that’s good for glass and for outdoor use. Follow the directions on the glue. Protect your work area with newspaper or craft paper. Make sure your room is well ventilated. Before you apply any glue, press the two pieces together to see where they meet. I misjudged and had to start over. Apply the glue to both surfaces. The glue is clear and dries clear, so you can goop it on liberally. This doesn’t have to be a fussy, detailed project. Even if there are gobs of glue out of place, no one is going to be looking that closely. Wait five minutes for the glue to get tacky, them press the pieces together. Don’t move your mushroom for at least two hours. It takes 24 hours for the glue to cure. Another tip: These look more like mushrooms when you view them from the side than when you view them from the top, so try to find a spot in your garden where you can see them from a good angle. One final tip: If you use a heavy bowl on top of a slender vase, your finished mushroom could be top heavy and tip over. To help prevent that, put some white stones or colored marbles in the bottom of the vase (don’t fill it all the way up) to counterbalance the weight of the bowl. Very clever, Connie. Looking forward to your demo. Finally a use for all of those flower vases that collected dust, sorry I threw them out, don’t tell my wife that they aren’t there. i LOVE this idea…. more garden ‘art’… and ‘re-use’ re-claim. thanx will try this weekend ! Cathy, thanks for writing. Yes, I love “upcycling” old items. Jim, your secret is safe with me! have made about a dozen or more… gave as ‘gifts’ and some i can’t part w/ so they’re everywhere in my yard. 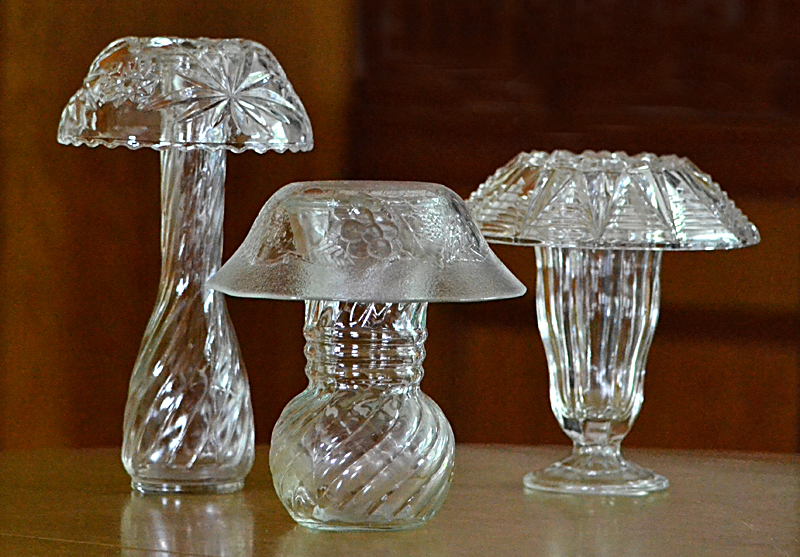 can go ‘big’ or small.. some i did w/ glass candlesticks, and small bowls, found in thrift shops. brilliant, and in the sun ? or SOLAR lights at nite ? ‘magical’. Cathy, your art pieces sound lovely! If you have any photos of them, I could post them on the Your Photos page. Email your photos to me at connie@buffalo-niagaragardening.com. How pretty! What a cool idea!